Weighty Matters: The UK Advertising Standards Agency finds juice to be non-nutritious. The UK Advertising Standards Agency finds juice to be non-nutritious. Well not exactly, but bear with me. 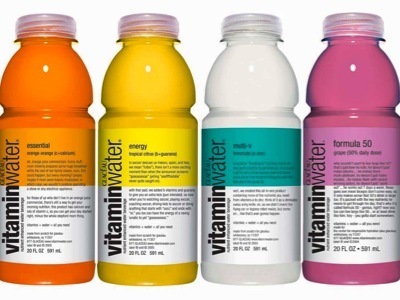 "Because Vitaminwater contained about a quarter of a consumers GDA for sugar as well as the added vitamins, we considered that the description of Vitaminwater as ‘nutritious’ was misleading." So what's about a quarter of a consumer's GDA for sugar? 4-5 teaspoons. What else has 4-5 teaspoons per glass? Orange juice, apple juice and pretty much any other fruit juice. Some, like grape juice, have even more. Of course there'll be those who argue that the sugar in the Vitaminwater is "added" sugar, but me? Sugar water's sugar water, whether the sugar was added by God or by machines is inconsequential. Think of it this way. If you took pure spring water and added to it 5 teaspoons of sugar and exactly the same amount of vitamins and minerals as you'd find in orange juice then for all intents and purposes nutritionally the beverage would just be orange juice. So if the UK Advertising Standards Agency is unhappy with Vitaminwater, I think they also ought to be unhappy with juice.